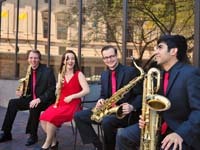 Bio: Founded in 2015, Fuego Quartet is an award-winning chamber group devoted to the performance of both standard and contemporary works written for the saxophone. Most recently, they were awarded the Gold Medal at the 44th Fischoff National Chamber Music Competition, 1st Place in Brass, Winds, and Percussion at the 8th Plowman Chamber Music Competition, and 2nd Place at the 2017 National MTNA Chamber Music Competition. Comprised of graduates from the Eastman School of Music, Fuego has been featured in a variety of settings from standard concert hall venues to community engagement concerts. They have been featured artists at the Strong National Museum of Play, The George Eastman Museum, Dorris Carlson Reading Garden, Phillis Wheatley Library, Susan B. Anthony Museum, Washington Square Concert Series, OSSIA Presents, [Col][lab], and WXXI Classical 91.5. Founded in 2015, Fuego Quartet is an award-winning chamber group devoted to the performance of both standard and contemporary works written for the saxophone. Most recently, they were awarded the Gold Medal at the 44th Fischoff National Chamber Music Competition, 1st Place in Brass, Winds, and Percussion at the 8th Plowman Chamber Music Competition, and 2nd Place at the 2017 National MTNA Chamber Music Competition. Comprised of graduates from the Eastman School of Music, Fuego has been featured in a variety of settings from standard concert hall venues to community engagement concerts. They have been featured artists at the Strong National Museum of Play, The George Eastman Museum, Dorris Carlson Reading Garden, Phillis Wheatley Library, Susan B. Anthony Museum, Washington Square Concert Series, OSSIA Presents, [Col][lab], and WXXI Classical 91.5. Nicki Roman Soprano Saxophone Nicki Roman has been a prize winner in the North American Saxophone Alliance Solo Competition, Musi . . .
Harrison Clarke Tenor Saxophone Harrison Clarke is currently pursuing his DMA in Saxophone Performance at the University of Georgia, . . .
Erik Elmgren Alto Saxophone Erik Elmgren is a concert saxophonist, chamber musician, and educator dedicated to representing the . . .
Gabriel Piqué Baritone Saxophone Gabriel Piqué, 24, is a native of Augusta, Georgia. He holds degrees in saxophone performance from t . . .